It’s that time of year again where us data-driven marketing minded folks gather at San Francisco’s Fairmont hotel for a few days packed with content, partners and possibilities. 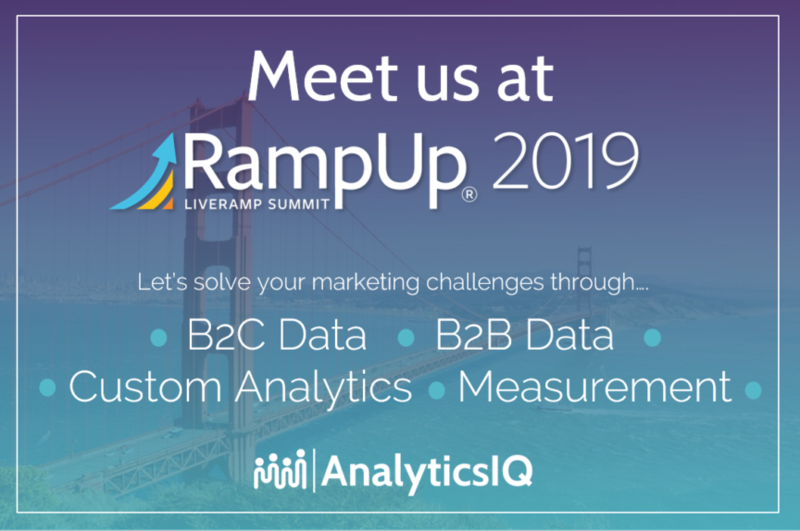 Yes, we’re talking about LiveRamp’s RampUp 2019, taking place February 25 and 26. Last year, we had a fantastic opportunity to participate in a session all about LiveRamp’s Data Innovators program. And in the year since then, we’ve rolled out some pretty exciting new products and services at AnalyticsIQ. We successfully launched our B2B marketing data offering – BusinessCore. We’ve made our data available for Advanced TV advertising. We’re gearing up to release a fantastic, new campaign measurement product. Are we giving you the impression yet that we like to innovate and make things happen? If you’re of the same mindset and are heading to RampUp this year, we’d love to meet you! If you’re an advertiser, let’s chat about your next campaign. If you’re a fellow data provider, let’s brainstorms ways to collaborate. If you’re a tech platform, let’s strategize new product ideas. Simply drop us a note at sales@analytics-iq.com to connect at the event. Coffee is on us!